Berlin's gigantic IFA consumer electronics fair opens this week, with the shadow of Apple looming large even if the iconic US brand traditionally snubs the event. 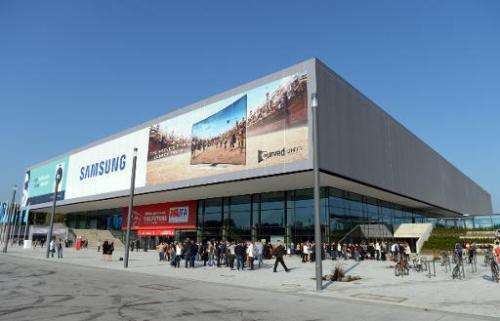 IFA, one of Europe's biggest showcases of the latest electronic gadgets, is scheduled to open on September 5 and run until September 10. But news that Apple will stage a mystery unveiling of its own on September 9 is likely to upstage any of the announcements made by its rivals at the Berlin show, analysts said. Mobile phone makers "increasingly announce more things at the IFA than in the past, because they want to unveil their products before Apple gets all the attention of the media," said Ian Fogg, analyst at IHS. Famously secretive Apple has offered scant clues about a possible new product in emailed invitations to the September 9 event. But rumours about Apple's plans have been swirling for months, with many observers convinced a new-generation iPhone with a larger screen is on the horizon. Some analysts are expecting Apple to unveil an iPhone 6, marking a move into the "phablet" sector, a cross between smartphone and tablet whichis proving particularly popular among mobile gamers in countries such as South Korea and China. But Apple might also unveil an "iWatch", a wrist-worn device that links wirelessly to its iconic iPhones or iPads. The US giant's rivals are hoping to deliver the goods in their snap-fire counter-offensive, with South Korea's Samsung in particular—the pioneer of both the phablet and the smartwatch—hoping to hold on to its number one position. Samsung is Apple's archrival and it looks set to unveil as early as Wednesday a new version of its giant-sized smartphone, the Galaxy Note 4. It was at the IFA in 2011 that Samsung unveiled its first-ever phablet, creating a new market segment into which competitors quickly followed. "All companies, even the Chinese ones, have a phablet in their portfolio these days," said Gartner analyst, Annette Zimmermann. Japanese firm Sony is coming to Berlin with its new Xperia Z3, and Motorola, recently bought by Lenovo of China, is also expected to unveil a new model. The battle is raging in the smartwatch sector. Rumours of Apple's iWatch pushed both Samsung and its compatriot LG to release the first details of their new wrist devices already last week, ahead of their launch in Berlin. "It's a sign that they're getting a little nervous," said Zimmermann. It was also at the IFA in Berlin last year that Samsung unveiled its pioneering model, the Galaxy Gear. "Margins are really under pressure in the mobile business. Except for Apple, topping the premium segment, everybody makes almost no money," said IHS analyst Fogg. "The smartwatch was a way to attract new revenue streams, by bringing a new smartphone companion that's very profitable because the market is still young and there's little competition," he said. For now, wrist-worn devices are still only for hard-core technophiles, but even makers such as Asus—better known for its PCs and tablets—are scheduled to present a smartwatch this year in Berlin. "Of course people are going to talk a lot about phablets and smartwaches, but there's so much more happening at the IFA," said Zimmermann at Gartner. Ultra high-definition (HD) television screens have sharpened their image quality still further. And flat-screens are no longer de-rigueur, now competing with curved monitors to imitate a cinema screen. This year's IFA will host more than 1,500 exhibitors on 150,000 square metres of hall space and almost a quarter of a million visitors are expected over five days, with products ranging from video surveillance cameras, to weather stations and even an intelligent house. Samsung is scheduled to hold a news conference on the house of the future on Friday.